Laylah's Patties and Jerk, commonly known as Laylah's, is a Jamaican restaurant in San Diego born out of Laylahs husband desire for authentic Jamaican food and her entrepreneurial spirit. Laylah learned to cook Jamaican food in Jamaica where she lived with her family for several years. When it first opened in 2008, Laylah's was simply a grocery store that offered Jamaican ingredients. In 2009, it evolved into the Jamaican restaurant that it is today. Laylah's takes pride in cooking its dishes with authentic ingredients only. It also commits to offering popular and traditional Jamaican plates such as Jamaican jerk chicken, oxtail and butter beans, curry shrimp and vegetables, and brown stew fish. 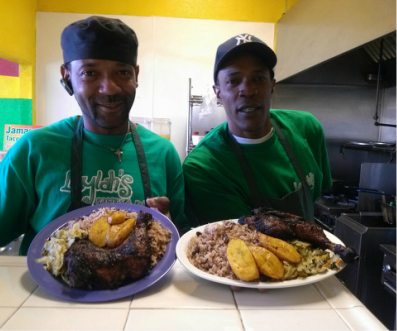 Laylah's mission is to become the best and most authentic Jamaican restaurant in San Diego. Laylah's jamaican food is named after Laylahss daughter. Laylahs's husband is from Spanish Town, Jamaica.